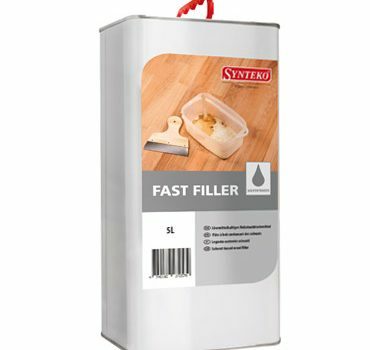 Synteko Fast Filler is a solvent based joint filler to be mixed with saw dust and is easily sanded. This very fast drying filler is developed to be mixed with fine saw dust to form a thick consistent mix giving a good colour match to timber floors. The fast drying solvent mix has minimal danger of causing a reaction especially with older type of coating used before. Ideally one would use sawdust from the edger or rotary sander of 80g or 100g sandpaper for gaps up to 2mm. For slightly wider gaps one would use courser grit sand paper dust. Synteko filler is trowelled over the floor surface forcing the Filler into the gaps allowing it dry and then sand off the excess.